Smart, bookish Belle, a captive in the Beast's castle, has become accustomed to her new home and has befriended its inhabitants. When she comes upon Nevermore, an enchanted book unlike anything else she has seen in the castle, Belle finds herself pulled into its pages and transported to a world of glamour and intrigue. The adventures Belle has always imagined, the dreams she was forced to give up when she became a prisoner, seem within reach again. The charming and mysterious characters Belle meets within the pages of Nevermore offer her glamorous conversation, a life of dazzling Parisian luxury, and even a reunion she never thought possible. Here Belle can have everything she ever wished for. But what about her friends in the Beast's castle? Can Belle trust her new companions inside the pages of Nevermore? Is Nevermore's world even real? Belle must uncover the truth about the book, before she loses herself in it forever. Beauty and the Beast are back, along with the familiar cast of characters from Disney's films...Readers will enjoy revisiting this magical world, where they can delve deeper into Belle and the Beast's relationship, and the adventurous Belle is a likable companion for these enchanted travels in Nevermore. Fans will also be cheered by the funny, heartwarming banter among the castle's enchanted servants. Like Belle, many readers may wish to escape their imperfect lives, and they might find bracing Belle's discovery that real life is to be preferred, for all of the chaos and pain that it brings. Readers who love Beauty and the Beast will greatly enjoy the opportunity to spend more time with their story. 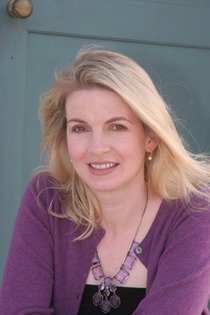 Jennifer Donnelly is the author of a novel for adult readers, The Tea Rose, and a picture book, Humble Pie. For A Northern Light, her first teen novel, she drew on stories she heard from her grandmother while growing up in upstate New York. She now lives in Brooklyn, New York. Imaginative characters, clever storytelling and a poignant message. I couldn't put it down. I was lost to and in love with every word of Lost in a Book. It is absolutely superb! A new classic, to be sure. I loved this book! It was a wonderful read and had an interesting side story. I was worried I wouldn't like it since I love the movie, but it didn't take away from the movie storyline. In fact, it added a bit of the pieces of how they fell in love. 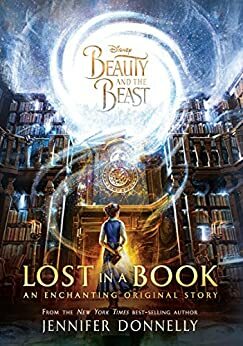 I would recommend it to any Beauty and the Beast fan. Fans of Beauty and the Beast will recognize the characters and the setting of this novel. The author has added two new dimensions to the story, one of the journey of Belle into the hidden world of the book, the other into the enchantment of the Beast's castle. Recommended. 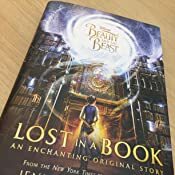 BEAUTY AND THE BEAST: LOST IN A BOOK by Jennifer Donnelly is a YA fantasy adventure featuring Belle from the classic tale of BEAUTY AND THE BEAST. Fans of the classic romance who expect a heart-rending retelling will find themselves lost in disappointment. This novel opens with a mind-numbingly boring prologue in the form of a discussion between Love and Death that left me rolling my eyes and skipping to Chapter 1, where I found writing that left me wondering if Jennifer Donnelly actually wrote this, or if she did indeed write it, why she hadn't revised the prose into stronger writing. It's all telling, telling, telling, as if this were the first draft of a book hurried along to publication so that it would hit the shelves in time for the new Disney movie. 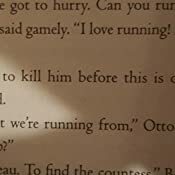 By page 50, I still hadn't invested in Belle, and I felt rather annoyed that there was zero character agency. All things "happened" to Belle, and I felt her dragged along by a boring, heartless plot. Though I forced myself to read a bit more, I lost interest on page 70 and gave this book to someone I thought would enjoy it more than I did. I collect Beauty and the Beast retellings, but I don't consider this a retelling at all, as it lacks romance. I badly wanted to love this, but in the end, this was a DNF for me, and I've added this to my list of "all hype, no might" novels. Although this wasn't for me, I think it would appeal to readers who don't mind cliches and writing geared toward younger-than-teen readers, and who enjoy a slow paced, descriptive adventure told in the style of pre-K story time. 5.0 out of 5 starsLove Always Wins! This was such a good story! Jennifer Donnelly did an excellent job in creating a book that's classically inspired but can also standalone. When I first heard about the book, I was intrigued and very much hoping that "Nevermore" was an Edgar Allan Poe inspired twist. While my theory wasn't completely correct, I was delighted with the incorporation of Greek mythology! If you don't know by now, I have a slight (ok, rather HUGE) obsession with The Beauty and the Beast. But this wasn't always the case. Not until Emma Watson and Dan Stevens graced the screen with their portrayal of the timeless classic in Disney's Live Action Release in March 2017. This new obsession launched a frantic search of books related to Belle and the Beast. Thanks to my bookish friends having an equal obsession...I came across quite a few titles. Marissa found Lost in a Book at her local bookstore....I got on Amazon and ordered it that night I think. However, I had to force myself to wait to read it because of prior commitments. 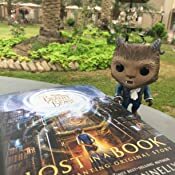 Lost in a Book is an original story set during the time Belle is a prisoner of the Beast. He gives her the library (My hubby built me a reading nook...that's pretty close to a library...) in the beginning of the book, and the rest of the story is all about the adventures (or misadventures) she has in the magical book, Nevermore, that she discovers while cleaning up the library. One of the themes of this story explains really well that getting lost in a book is good. An escape can be needed on occasion. However, don't take for granted the reality you have been given. Even if life is hard, and your path is heading in a direction that you weren't expecting...It is important to see the beauty in the life around you. Because even if it may be hard, it is REAL. 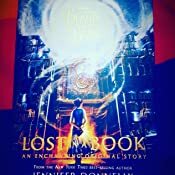 I purchased a print copy of Lost in a Book from Amazon. I was not required to write a review. All opinions expressed are mine alone. This was a fun and quick read! It takes the basic Disney Beauty and the Beast story and adds another element...a book Belle can step into to go into another world. The problem is Death is in charge of this world and if she eats 3 things from there and leaves 3 things she will be stuck there forever. The people in this world started to remind me of the monsters in the Doctor Who episode The Girl in the Fireplace as Belle began to see that world like it really was. Beauty and the Beast: Lost in a book truely delivered just what it promised - to assist in losing oneself in the story. This tale had all the ‘Feels’ from the Disney film and then some. I loved it. All the principle players were represented in the book with an added element of a magical book that literally is a doorway into another world - a world that appears beautiful and amazing but my in fact be an elaborate illusion designed to destroy not only Belle but curse her new friends and the Beast to stay in their enchanted forms forever. The ending was not quite as strong in parts than I would have liked as the two protagonists who had been staging the whole alternative world - Death and Love could have had a better resolution but it was still an interesting scenario and some of the dialogue between the sisters was indeed quote worthy. All in all a delightful story which added without undoing the story we all know and love.